Walking in, looking at the very first image, I was immediately struck with his liberal use of body color (opaque watercolor, also called gouache). 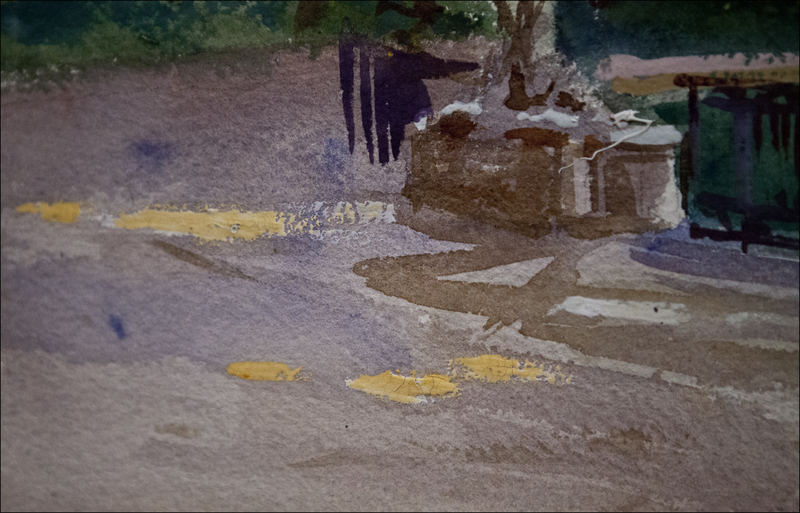 Watercolor purists shy away from gouache – because it alters the surface of the work. It reflects, rather than transmits light, and thus can be noticeably ‘on top’ of the image. JSS does not give a fig for such concerns. He demonstrates that it can be done, and done handily. So long as you make careful observation of color, and correct for the tendency of gouache lights to dry down in value. (Darks dry lighter, lights dry darker. Gouache is sneaky). I’m impressed both how much opaque pigment it he used, and how *MUCH* of it he used. Sometimes it goes on so thick, it’s impasto. I suppose it should be no surprise, given that he was so accomplished with alla prima oil technique. JSS believed a painter should make the broadest mark that describes the form at hand. One stroke is always preferable to 2, and certainly to 100 fiddly marks. In this way he’s the opposite of perfectionist tiny-brush-blenders like Bouguereau, and subtly different from dab-dab-dab impressionists like Monet. He is not accumulating the effect of many small marks – he is carefully placing exactly the right one. It makes sense then, that in watercolor he has the largest brush possible – the wash. He is certainly in the a habit of making big blocks of shape (a figure, a tree, or a piece of architecture) out of single, well planned wash. Then going back to add detail with touches of opacity. The figure on this fountain is a silhouette, executed in one pass. The light on the leg is brought back on top with body color. We also see the streams of water indicated with thick impasto drizzles. Here’s a close up of how the large wet-in-wet silhouette of the lady’s dress is modified by strokes of gouache. Again, it’s impressive to me how thick he goes. Another variation on ‘detailing of big shapes’ is his execution of water and dappled sunlight. Here the wet-in-wet washes that make up the muddy-stream-bank-grading-to-blue-water are completely worked over with dabs of opaque sunlight (white and yellow) and intense blue shadow. The underlying blue-green water would have been made in one wet passage. He could have tried to reserve all the glinting reflections, (paint around them) but that would have probably resulted in a stiff rendition, and would certainly have made undesirable hard edges inside the water. As well, cutting around lights slows you down. It seems JSS was not interested in painting slowly in any of his works. He’s on record as a guy who’d rather re-paint a speedy execution twenty times than take 20 times as long to do it once. His solution here, coming back on top with opaque dabs, is remarkably efficient. The large smooth water surface is transformed into ripples by this ’net’ of marks. One could say that this sketch is almost entirely opaque painting – if you measure it by the surface area affected by these retouches. They are everywhere! Spread evenly over the entire painting. Here in this painting of weird fruit (I can’t recall what these are?) – the ‘blotchy’ mass of dark foliage behind is completely transformed by opaque strokes making ‘sky holes’ in the canopy, but also vines, small twigs and hanging dry leaves. I would argue again, that this painting is only partially watercolor – the full effect of the work in entirely present in those lively opaque strokes. I offer you this example of an oil – just to demonstrate how the flecks of light over a dark background are used to create the effect of a shadowed forest. This is the oil painting thinking that you can see appearing in his water-works. Here’s another simple but perfect example. These streaks of sunlight on the ground *could* have been reserved whites – but I like the way he just ignores them at first – so his passage of earth can be executed without pausing – then goes back to hit them later. It looks to me like he’s painted these first in white – then going back to touch them again with orange. I might be crazy, but there are a number of paintings I think he’s hit the highlight twice. One theory is this might avoid carrying too many colors in the field. He can bring just the white gouache, then tint the white strokes after they dry. Thus getting any color he wants without bringing too many tubes. You could of course just mix the gouache and watercolor together – which he also does at times – but it might have been a case of wanting to push on without pausing for mixing paint. One last on this subject – just to emphasise how thick he puts it on. I have a theory – I read that chemical analysis determines he’s using zinc white – so it’s possible he had to do this to get complete coverage. Zinc being less opaque than our more commonly used Titanium white. I can’t be sure if he meant to include these gondoliers in the lower right from the very beginning, or if they were a last minute addition. But in either case, four complete figures of the boatmen and ladies under parasols were painted on top of the dark shadow, entirely in body color. That’s a significant ‘retouch’ JSS! Interesting trivia from the wall text – apparently he was known to pose a travelling companion and move them around multiple times to manufacture a nice grouping of people. (Reportedly done in that cluster of attentive students in the oil above). So this might have been one boatman and tourist cloned, or (more likely) might have been an amalgam of numerous boats passing by as he painted. JSS has a trick with painting faces – there is never a white highlight on the features. They are all positioned into the mid tones. I’m thinking that a specular highlight on the face would be considered too distracting. I heard Jeremy Lipking say the same in a workshop – if there is a white gloss on the nose or forehead, he leaves it out. So here we have a couple of examples of JSS creating the ‘egg’ of the head in a wet-in-wet manner, then coming back to cast directional light on the side planes. Or to pick out detail like the old guy’s beard. He is consistent in his approach – he doesn’t want to try and reserve all of these light-flecks when he can just add them later. This is seen again with these North Africans. The shape of the head covering is done as a silhouette – which is then modified with opaque strokes of peach and bright yellow. 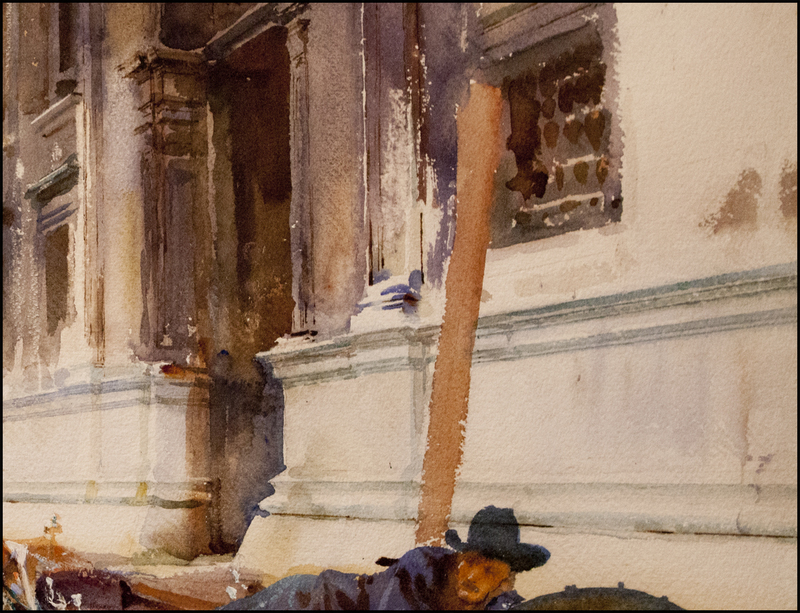 In this one – done from life – the initial washes have been completely worked over with opaque details. He’s taken simple silhouetted figures and created folds in the cloth, facial details, and dramatically indicated a late afternoon sun casting raking light on the tent and the shoulders of the standing figures. Those orange/peach accents are so strong, that once again I’m going to have to insist, it is the opaque touches that make the sketch a success. JSS has a small toolkit of special effects, which I’ve heard of people doing, but frankly never paid much attention towards. I tend to think ‘tricks’ are a waste of time – that we should just be mastering drawing first and not distracting ourselves with effects. But there are a few things that come up again and again in his work. These ‘tricks’ often support his philosophy of working freely with large washes and big strokes – but coming back for the key details. Here’s an argument for working on good paper! JSS is drawing with a pen knife – adding small details which are sharper even than his white gouache note. Effectively these are ‘white ink’ lines. By using clear wax – perhaps just a blob of candle, one can partially reserve textured lights. The wax adheres to the bumps on the paper, and when a wash comes by, it can’t penetrate the wax – thus leaving a mottled light. JSS uses it frequently in foliage, plaster walls and rocks. My theory is he lays down a bright wash representing the lightest local color, then textures with wax, and when the dark comes on top, the color underneath is allowed to show through in an interesting organic mottled effect. Here’s an example where he’s using the wax in combination with gouache to complete a work that is much more than just a transparent painting. What I think happened here is this: First, he paints a very free rendition of the impressive pink blossoms on this magnolia. I expect he paints the green foliage next, then works over some of the leaves and picks out branches with wax crayon. (I think these are crayon marks at upper left and on the small extended branch at far right). Now he cuts in the dark background, trying to stay away from his bright blossoms and getting the wax resist texture effect. It looks like he has to touch the background twice to get it dark enough. That’s a pesky aspect of watercolor for sure. Finally he goes back into the blossoms, which have probably lost something during all this, and he restates the petals in a rich impasto. In this case it looks like he’s using a loaded brush with more than one color of gouache to get variegated marks inside single brush strokes. Cool hey! It’s quite a multi-media approach. I’m going to have to try it all out as soon as I get a chance. Here’s an example a limited use of pen and ink. This distant figure is subtly enhanced with linear details. Interestingly, not black, but sepia ink – so it is not too strong. But the eye is still drawn to the sharper details on the figure in the midst of the abstract handling of this field of marble blocks. I don’t know why this should surprise me – but it’s worth noting that he used a straight edge on architecture. That should put an end to the comment ‘I could never paint like that, I can’t even draw a straight line’. This is not actually an effect like the others – but I didn’t know where else to discuss it. It’s interesting to see JSS’s observations on bright sunlight. It’s something that I can’t help but compare to modern HDR photography. It’s not really the same, but this is something that’s on everyone’s mind these days, what with the new iPhones offering automated HDR. The point is – in these examples of white objects in a sun-lit situation he has made very specific groupings of value. The bounced light in marble plazas creates a situation in which shadows are lighter than you would expect. Ambient light reflects off the white surfaces thereby lightening cast shadows. In order to emphasise this effect, he makes the sky and distant trees darker than you also expect. He pushes everything in the background down in value so it is darker than the shadows on the marble architecture. See how dark the sky is between these two pillars? It’s like a simulation of that effect where you come from a dark theater into sunlight, or vice versa. For a moment your eyes are adjusting, and everything looks bleached out. If JSS was staring intently at the details on an ornate fountain, and then switched a glance to the trees behind, he might have noticed this optical effect. This is also why it’s un-advisable to paint wearing sunglasses. You really can’t see the full range of values. Those are really helpful and informed insights. 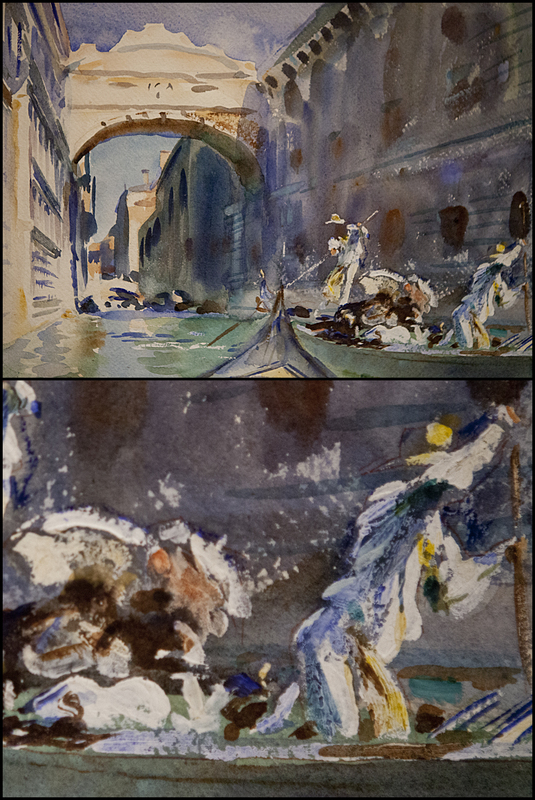 I love the way Sargent ignored the transparent-only purism of the British school of watercolor. Gouache and opaques were used more in France apparently, but that’s where he got his early training, and it makes sense he would transfer a lot of his oil sensibilities to water media. I’ve tried the wax resist over a bright underlayer, and it’s great for backlit leaves, though I wonder if using gouache over any of the wax would create adhesion problems. I agree that he must have traveled with not only a knife and a ruler but he says, a plumb bob. His perspective drawings under architecture are very exact and accurate. Were you able to see pencil underdrawings on the figures or other details? You could certainly see a fair bit of pencil under the architecture – even ruling pen with sepia ink – but other than the one inked figure he seemed to start most of his people with silhouettes drawn with the brush – no wait I take that back – I think there are pencil lines visible under the woman’s face in the plaster wall wax example. Judging from the reproductions in the great Richard Ormond books on Sargent, JSS used faint pencil marks quite a bit whenever good proportions were called for – on watercolors of figures and architecture. The maddening part is that there seems to have been little to no correction – his marks are well placed to begin with. My guess is, Sargent had near photographic memory and an unusually good sense of proportion and shape – he didn’t need to labor intensively and continually redraw and re-measure everything. I have always enjoyed Sargent’s work because of his mastery of light. Thanks for giving me some insight has to how he did it. Thank you for allowing me to share an exhibition I cannot watch – unless I fly over from Europe. I could not do all the analyses myself, anyway – so this was more than just sharing – it was a short but very educating guided tour. Great notes for those of us who can’t get there to see the paintings in person. THANK YOU!! I think the strange fruit are gourds. A great read and insight into his techniques. The breakdown of these images certainly will be remembered when I am out painting with the Richmond Hill Group of Artists this summer. Thanks. I look forward to more! Wonderful report!, I learned so much that I am ready to fully apreciate the exhibition if I ever get the chance to see it. Thank you for sharing your observations and teaching us. What a great blog!! It was so informative. Oh Jan! How wonderful of you to give us this gift of your insight and experience… It was like a walk through a museum with a beloved guide who had somewhere along the way fallen completely in love with JSS and his work. Thank you so much!!! Thank you, Marc for this generous & insightful analysis. Informative & inspiring. It also reminds us that we shouldn’t be too preoccupied with “rules”, such as the ones about reserving whites in watercolours. Sadly, I’m on the other side of the world in Australia, so will not get to see this exhibition. Thank you for sharing. I am grateful to Marc Taro Holmes for publishing this erudite post. Not only did it inspire my wife and me to visit the exhibit before it closed but Marc’s insights enriched our understanding and appreciation of what we saw. I am very impressed with the organization, clarity and expertise of this essay and its contribution to art lovers around the world. The Citizen Sketcher is a good citizen of the art world. Thank you, Marc! Such a beautiful, indepth review of my favorite watercolor artist. Very inspiring. I love how you explain how his unconventional approach enhances his work. Great review and insights. Thanks Marc. Really wish I could have seen the exhibition … he truly was a great master. 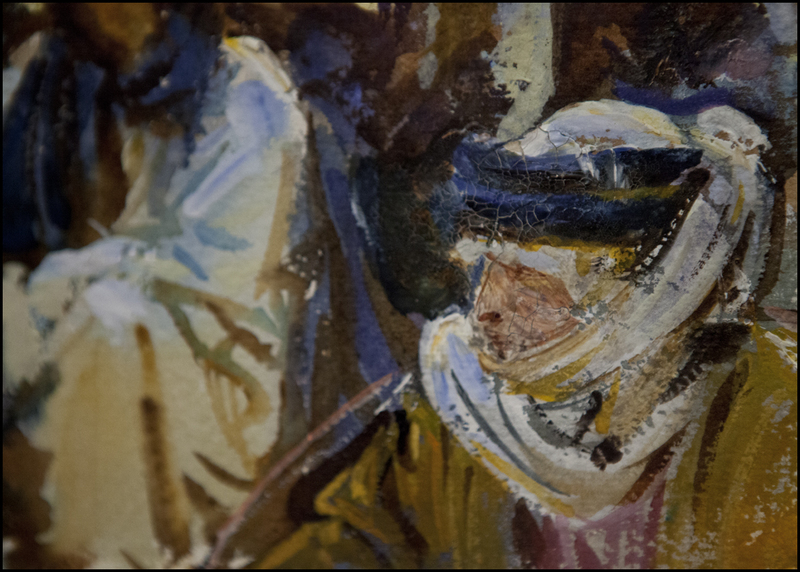 Loved hearing your insight into how Sargent probably handled many of his watercolor paintings. What a wonderful report/essay. Think I’ll pick up my new Sargent’s water colors book and look at it with slightly different eyes. Also just received my 2014 Sargent’s watercolors calendar from Amazon. Only $10, I think and the book was $35. Live close to Boston, so I’ll be sure to visit his exhibit in the fall (this time sans grandchildren). The quality of the images in both book and calendar exceeds what I expected. Marc, an excellent analysis – I have book of JSS watercolours and have often gazed at them and wondered, how did he DO that? So thank you! This was great info. Thank you so much! 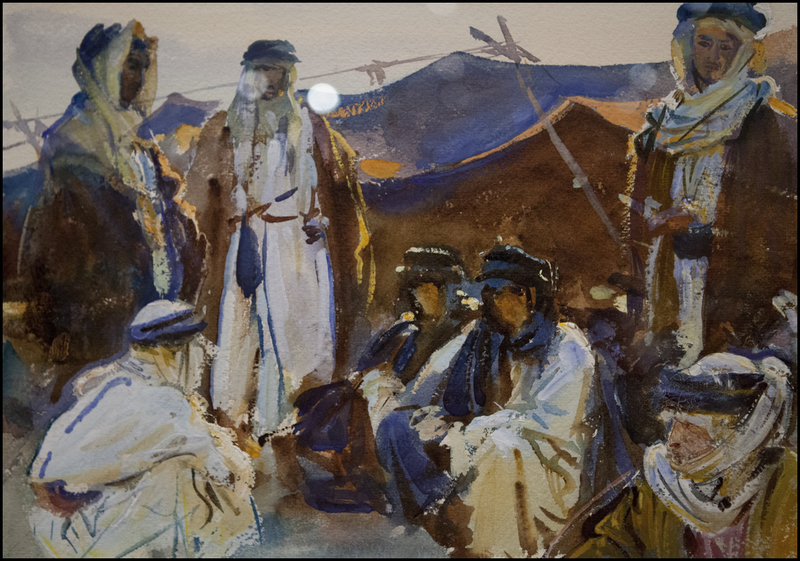 And if anyone want more, the current exhibition’s catalog, John Singer Sargent Watercolors which is available from the Boston MFA online store provides a wealth of in depth info about Sargent and his techniques. I’m trying to absorb extensive information it contains before going to Boston next week. The colors in the reproductions are excellent and the price for so much information and so many images is a steal at $39. The 9×12 volume of 248 pages is full of essays (12) by an amazing collection of experts and covers his approaches to capturing the various locations he painted. Plus there are essays about the history of the collections themselves and a wonderful one by two conservators who have worked with the collections in Brooklyn and Boston and also talk about technique and materials. It’s a wonderful compliment to Marc’s essay here. 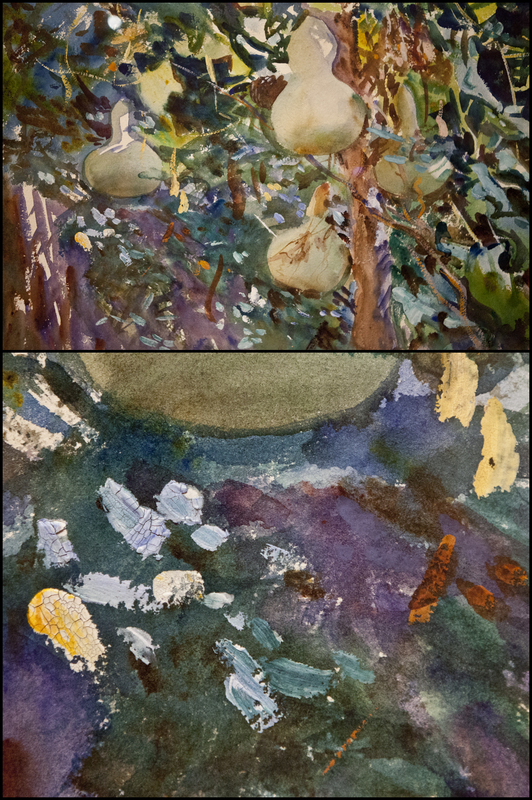 The “fruits” in the painting are gourds drying on the vines. Really! cool. Had no idea gourds grew on vines. I’m used to pumpkin patches on the ground, so always assumed gourds were the same. But that makes sense as soon as you say it. Yes! 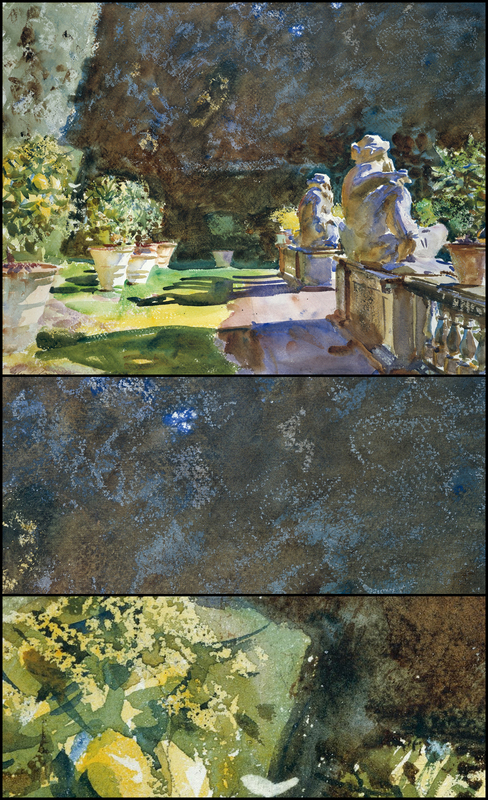 I saw John Singer Sargent Watercolors at the Boston MFA last weekend. Being a watercolorist myself, I found the exhibit inspirational. What was interesting to me is that he used opaque white in his watercolors, as do I on occasion. His paintings had so much movement and bold color in them, I couldn’t take my eyes off of them. Wonderful exhibit! Hi, I live in a remote area of Spain, so have no chance of seeing this expo! Thus I feel I should express my gratitude to Marc for taking the time and trouble to put together such a carefully analytical evaluation of the work of JSS. Thanks Marc for your efforts! I found your comments insightful and inspiring. I used gouache many years ago as a student of commercial art. I always enjoyed using it and have recently invested in an airtight Mijello palette so that I can join my local group of watercolorists in Granada using a water based medium that can be employed using opaque oil-type techniques. Your report has given me the “get-go” to have a crack at trying a similar approach to that you described as used by JSS. So, many thanks!! One advantage we do have here in Spain is the Sorolla museum in Madrid. ( He was of course a contemporary of JSS). Small and intimate, set within what was once his family home it is a unique place, and is world class. Situated close to the Prado which is full of Velazquez, and the Thyssen Museum which abounds with 20th century work, go and enjoy it if you have the chance. Acuaralistas de Andalucia are launching a travelling expo of 75 selected watercolours done by members starting in March, which will move among the 8 most important cities of Andalucia including; Huelva, Granada, Sevilla, Cadiz, Cordoba, Almeria, Jaen and Malaga, in celebration of their 25th anniversary as an association. Check it out!! Mark, most instructive. You have done a real service to us JSS lovers! Great post Marc- thank you. I will also heartily endorse the catalog of this exhibit. It’s terrific. I was intrigued with the wax-resist technique and tried it myself a bit without much success. I had thought JSS used a crayon or something and was trying my kid’s crayon for this purpose. But I saw on the Blick site that someone makes white/transparent crayons specifically for watercolor use. I may try them. I have also not tried this – but I’ve been told a stub of candle might have been the choice back then. The weird fruit is a hard shell gourd and it is the same as ones gourd artists decorate. Thank you for your analysis of Sargent’s watercolor painting methods, it was most informative. thanks Marc for such an interesting insight to Sargent’s technique! This is the most amazing blog, with such a wide variety of influences and ideas. Have you seen the Spanish artist, Sorolla’s work? He started out trying to highlight the injustices of society, and then somehow he seemed to become seduced by sunlight. His pictures seem to sparkle. It has been a while since you published this and I remember Shari writing about the exhibition then but I just read your report now. Thanks a lot for sharing your observations and personal reflections on them so freely, Marc. And it reminded me instantly that two years ago there was a great Anders Zorn Exhibition in my hometown Lübeck/Germany. I could´t make the trip then but my mother was so enchanted by his work that she bought the ample catalogue and send it to me. So I enjoyed at least in pictures the variety of his work. There is one especially that had always impressed me because of it´s free use of opaque colors for the water lilies on the lake. [http://commons.wikimedia.org/wiki/File:Anders_Zorn_Landschaftsstudie_aus_Mora_1886.jpg]. Here in Spain speed painting competitions are quite popular and from spring to autumn there´s hardly a weekend without any in each part of the country. Obviously as an watercolor painter you won´t destroy the big beautiful washes by leaving some water lilies white to detail them later but there are always some purists criticizing on your use of white for highlights or details. Your comments on JSS´s work makes me more comfortable in using my tube of titanium white in public. =) Thanks again and a warm hug from north western Spain! Fabulous and fascinating article, thank you for your insights into this remarkable body of work. A “rebel” of watercolor!.. It’s very refreshing to see him breaking the rules like that! And I think that your thoughts add a lot to the experience that i wouldn’t have caugt had i attended the exposition myself! Very interesting post on an artist I really admire. To see how much he used ‘mixed media’ techniques in his watercolours is especially interesting as I’ve always thought of his watercolours as being very pure, ie, white paper for lightest tone, no body colour, etc, etc. I’m rather glad to discover that he uses the paint and other media together to get the picture right and not worry about these restricting rules. I especially love the candlewax technique – using the resist really gives little sparkles of light – very good for leaves. Thanks again for such insight from this great exhibition. This was a wonderful essay on JSS. Thank you very much. I have lots of ‘old church candles’, the kind with a certain percentage of beeswax, and will try this technique soon, along with the line and scratching. And in general, loosen up! Thanks Marc for the interesting article on JSS’s techniques. There seems to be a lot of crackling of the paint surface where he added gouache in the close-ups. Do these take away from the paintings and the archival quality or is it just noticeable in these shots? That’s an interesting question. I don’t feel the cracks take away from the work – even though they are visible. He uses the opaque strokes in clever touches that bring light back into the image. At times (such as in the Italian marble quarry) he uses the impasto to make the solidity of rocks. So, no, they don’t take away artistically – they really are crucial to his style. Now speaking in archival terms – that I can’t say. I would imagine they are indeed fragile. But so is watercolor in general. He uses, as all water-colorist of the day, Alizarin crimson for instance – which is highly fugitive. So – these works have to be carefully preserved in the first place. I would say any extra fragility from lumps of gouache flaking off – it’s all part of the masterpiece :) Watercolor and gouache is the way he was able to achieve these tremendous effects while painting on location. So, it’s just all part of the territory. He might have done them in oil and they’d be more eternal – but I bet if he had to drag his easel and paints up to the marble quarry – well, we might not have these works at all in that case hey? May be worth pointing out that they did have Cameras back then, even if it was a relatively new thing. His paintings always looked cinematic to me for some reason. i’m convinced sergeant was inspired by cameras. Thank you so much for your insightful interpretations of my favorite watercolor painter! Now I will not need to feel guilty about using gouache…if JSS can do it, so can I. 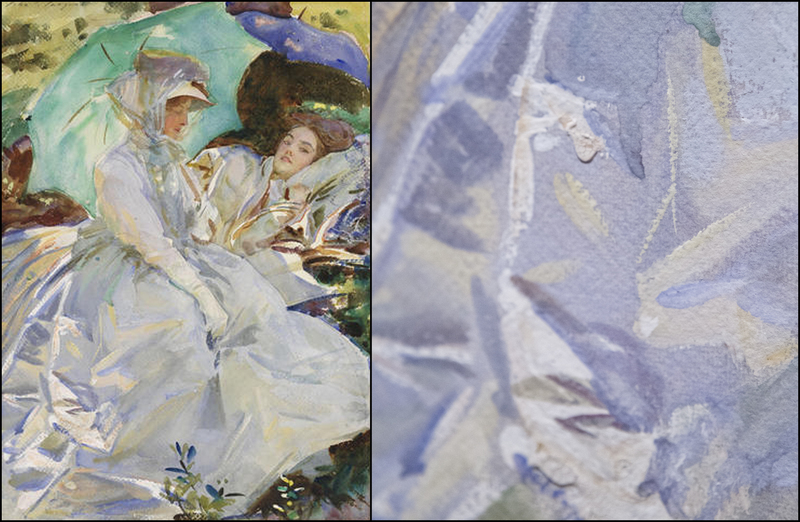 Upon visiting a John Singer Sargent exhibit at the Art Institute years ago, I was so taken back by his successful use of apple green watercolor that I had to go back and rethink my color choices. Began watercolor 40 years ago, but needed to put everything aside while I developed my Faux Finishing business…..This article is helping me “re-invent” my career after 25 years of servicing clients and advising Historical Landmarks. I am so very grateful that I found your “Travel Sketching in Mixed Media” online class at Craftsy and might I add that I am really excited to begin the “Sketching People in MOTION”. Thanks Again for giving and sharing your observations. Hi Mark!..Just caught your reply…:^D…thanks so much for taking the time to check…I am currently working on another intense project that forces me into a bubble….for a more involved project please go to http://www.classicalbycynthiablog.com and check the Springfield, IL Old State Captial restoration project….was there for 6 months and I was really trying to give and accurate account of the work in progress. These are wonderful observations, Marc. Beautifully articulated. Thank you for taking the time to produce this post. Marc, I’ve just discovered your wonderful blog. I thought I’d make a comment on this post since I just had a tour of JSS’s work at the National Gallery in WDC. They recently acquired 2 more JSS oils and a number of watercolors. I saw a notice about the lecture and attended an hour walking lecture discussing his oils. The curator is thrilled at the new acquisitions and noted the Nat’l Gallery now has examples for almost every year of JSS’s artwork dating back to when he was about 12 or 13. I didn’t realize how many watercolor he had done until the lecture. We were informed anyone can pick out a number of watercolors from the collection (by seeing them online) and request a viewing. Anyone in the WDC area might want to check out the website and request a viewing. If you plan to visit you might want to set up a meeting before you arrive. Its all free! Well Lydia, thanks for letting everyone know. That’s tremendous. There’s really a lot going on at the National Gallery. I’ve never been, but it is only a day drive I suppose :) (By the map – maybe a long day in real life). Thank you, wonderful article. I am going to see the exhibition in London shortly (Dulwich Picture Gallery) and will return to this. Marc,Thank you for your in depth explanations of some of this wonderful work by JSS! 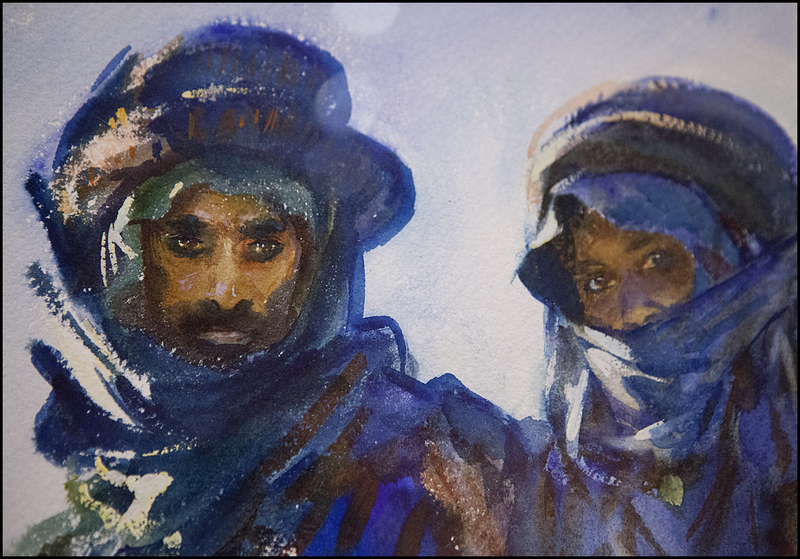 I saw a good amount of his watercolor work here in Philly, earlier this year (along with some very inspiring Winslow Homer exibits) – It was wonderful! Thank you so much for this article. Seeing the “tricks” at close range just make me even more impressed! This article was terrific! I loved the whole attitude about JSS and his use of gouache. Clearly, he was a free spirit when painting his watercolors, playful, confident and absolutely in it for himself. I liked your observations and guesses at, not only his techniques, but perhaps even more importantly his philosphy and thinking behind them. For a while now I’ve been thinking “well why would ANYONE constrain themselves and avoid learning what might happen if … especially when sketching. I’ve been feeling terribly guilty using , my self discovered gouache highlights, till I read your notes. PHEWW! Not that I use it excessively but it does add wonderful effects when needed. I especially like to use thicker light colors over darks to give life to what would be dead areas. Great read…thank you so much ! What a brilliant review!! Thank you very much for all the technical details that you’ve given, really informative. Just a beginner, so thank you for your article- it’s really super.